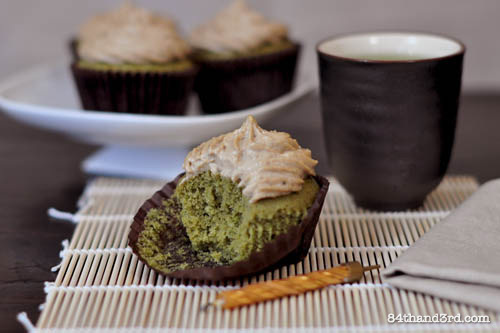 Matcha Green Tea Cupcakes – or Maccha. As you were. Welcome to the May Sweet Adventures Blog Hop, our theme this month – ‘What’s your cup of Tea?‘ – meant that I got to create a recipe using one of my favourite things – Tea. It was only logical that my creation included another of my favourite things – Cake! 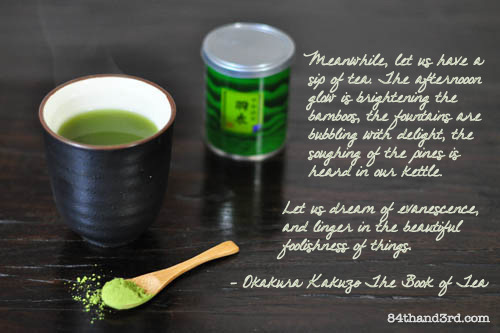 The first time I ever saw macha was in the movie Karate Kid – remember the tea ceremony? Yep, that was macha, although back then I had no idea what it was. If you don’t remember the original Karate Kid, well, you probably never had a walkman or made mixed tapes either… and I don’t want to talk about it. Now down to the business of cake. One thing about being the person who makes the cakes is that when it comes to your own birthday, well, if you want cake it generally means you make your own… not that I’m complaining, we all know how much I love to bake cake – and besides, it means I get exactly what I want – ha! Plus RJ has been known to come home with a treat and a candle every now and then – he’s a keeper. As the timing of this hop coincided perfectly with my birthday on Saturday I decided that cupcakes were in order – how very convenient. These took a couple of goes to get them just right, so for all of last week we were taste testing, tough gig hey? Third time is a charm and I’m so happy with how the cakes ended up. Not too light and spongy that they are like eating air, not too heavy that they are more like a scone than a cake. A little bit sweet but the macha still shines through. And topped perfectly with what I am calling Vegan Chai Buttercream. They are conveniently healthy enough to eat for breakfast, not that I did that [yeah right, totally did that] and delicious enough to serve as proper cake. Everybody wins. Australia’s Biggest Morning Tea and a Giveaway! Australia’s Biggest Morning Tea is an annual fundraising event held by the Cancer Council on May 24 – just a few days from now. On this day, or any time in May or June, you can register to have a morning tea at work, school or home and help raise money to continue the Cancer Council’s vital work in cancer research, prevention and support. You can even hold a Virtual Morning Tea. The SABH Tea theme occurring at the same time as Australia’s Biggest Morning Tea was a fortuitous coincidence but as a result we have a surprise for our #SABH participants this month! The Cancer Council and Australia’s Biggest Morning Tea have offered to donate a prize pack for a giveaway – exclusively for those who link up with SABH. The prize pack includes an Australia’s Biggest Morning Tea apron, tea towel, mug and oven mitt, plus Gwyneth Paltrow’s amazing cookbook, Notes from my Kitchen Table. Gwyneth, along with a number of Australian celebrities and chefs, is an ambassador for the event. To enter the giveaway simply link-up your Sweet Adventures Blog Hop ‘What’s your cup of Tea’ post during the week of the hop – that’s it! The winner will be chosen on 29 May by random draw, perhaps from a teacup – heehee. While we love our international adventure participants you will need to have an Australian mailing address to win. You can find out more about Australia’s Biggest Morning Tea at www.biggestmorningtea.com.au and www.facebook.com/australiasbiggestmorningtea. Register to hold a tea, find one to participate in, donate or enter their competitions and support the Cancer Council. Preheat oven to 170C [340F]. Fill a roasting pan with a few centimeters of hot water to warm the pan. Line a 6-hole cupcake pan with papers. Bring a pot of water to the boil. Combine dry ingredients and sift twice. Set aside. In a large bowl beat the room-temp eggs with an electric beater for 5 minutes. Begin to drizzle in the rice syrup and honey, beating for a further 3 minutes. Drizzle in coconut oil and beat in. Sift dry ingredients over egg mixture and gently fold in – making sure to combine well. 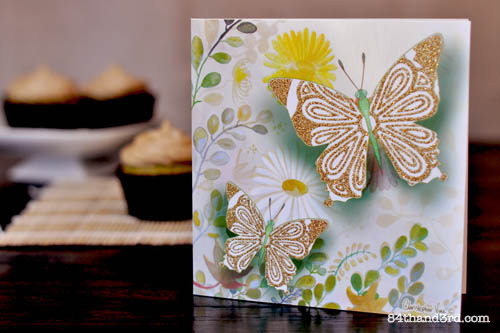 Divide mixture evenly across the 6 lined cupcake holes – they should be quite full but still below the edge. Empty the hot water out of the roasting pan and replace with approx 2 cm / 1 inch of boiling water. Place cupcake tin in the roasting pan and cover tightly with foil. Place carefully in the preheated oven. Bake for 15 minutes, remove from oven and uncover. Gently tip cakes out of tin and cool on a wire rack. 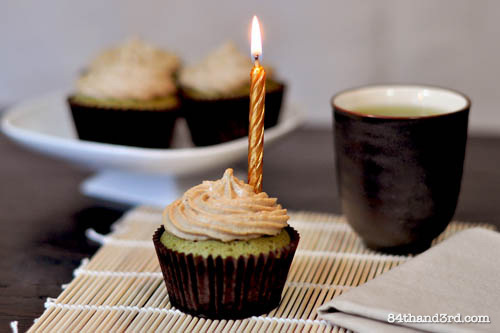 Frost with Vegan Chai Buttercream. Most of the time I use almond meal from whole almonds, it includes the skins and is a bit more coarsely ground. For this however I used regular almond meal from blanched almonds – no bits of skin and much finer. The hop is open from 9am 21 May – 11:59pm 28 May 2012 [Sydney time] Please only link-up new posts published on or after this link went live. * Linking the badge or a line of text to the hostess post [that’s this page here] means others can view the instructions on and join in! Click here for the Thumbnail List code – Copy the code and add it to the bottom of your Tea post, you will need to do this in HTML view. * REMEMBER – if you are on wordpress.com [not self hosted] the list will not show on your blog. A text link back to this post means others can hop through the entries! * On the entry screen, please add the link to your Tea Post [not your homepage]. Remember – by linking-up this month you are entered to win a prize pack compliments of Australia’s Biggest Morning Tea and the Cancer Council! Thank you to the Cancer Council and Australia’s Biggest Morning Tea for the prize pack giveaway. We are proud to be able to support the cause. thanks for the b-day wishes and for joining us! Amazing what a pastry tip can do (smoke and mirrors I tell you – heehee) Earl Grey is quite popular for the hop, hope you do join us! Gorgeous cupcakes JJ! I’m a huge fan of Matcha too, it’s so versatile. I haven’t tried it in cupcakes yet though! 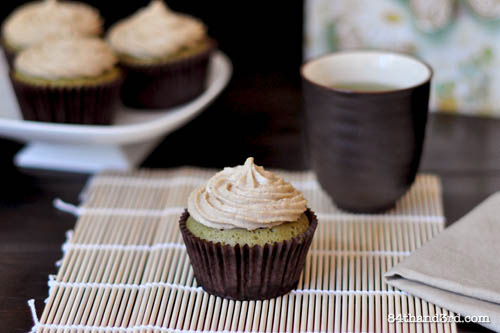 Green tea and chai in one recipe? Woah, JJ – you’re blowing my mind! And yet I can totally see how this would work. Nice one! Thanks for hosting and I hope you had a fantastic birthday dear! You know I don’t like to play it safe 😉 Thanks, it was a good one! I do miss my mix tapes… play lists are just not the same! Sadly I owned a Walkman and made my own mix tapes, I won’t ask how old you were on Saturday, but Happy Birthday! And these cup cakes look divine! I wonder if I’ve had Macha before…I’ve had A LOT of green tea in Japanese restaurants here in Oz? And I’ve had a lot of cupcakes in my time too (and I did have a walkman and I USED to love making mixed tapes). 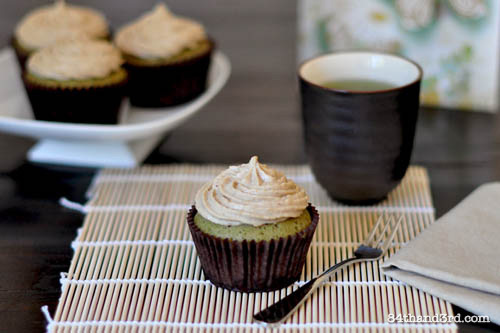 Matcha green tea cupcakes are a staple at my house! Almost every time I feel like cupcakes I pull out my big jar of matcha! Great theme- I’m hoping I’ll have time to enter a recipe! True enough, it was made from the heart, it is made even more special. I won’t doubt that you love macha. Guess what? I do too. This is a must try! Thanks for sharing. I hope you didn’t put your wife’s brother in the cupcakes!! They are all Anglicised versions 🙂 Yes, Maccha would also be correct (slightly more correct) – but I have never seen it used as macha before. Happy Birthday for Saturday! Your cupcakes sound absolutely gorgeous and I love the little brown patty cases you have them in, too. I’ve been meaning to have a go at some green tea ice cream and this has been a nice reminder of how subtle and lovely the flavour of macha can be. 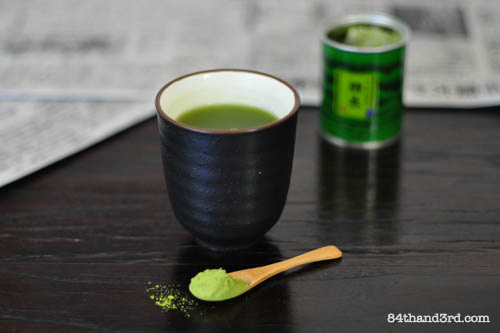 I will have to bear this recipe in mind to ensure I get the most out of the macha powder when I finally get around to purchasing some. Thanks again for hosting the blog hop this month, I’m really starting to get into it after a few goes at it now and the wealth of recipes on offer each month are always so inspiring. Looking forward to making my way through them all and seeing what the next round brings. Thank so much and glad you are enjoying the hops! The ideas people come up with are amazing aren’t they! Such an inspiring recipe JJ. Simply wonderful. Best wishes for your birthday too! 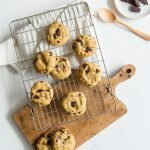 And so many beautiful recipes in the blog hop! Not sure I’ll make it this time (I’m a little under the weather). Thank you for hosting the blog this time around. Cheers Lizzy. Oh no, I always look forward to your treats, hope you feel better soon! Happy Birthday! It was a birthday weekend with my entry also being a birthday dessert for my hubbie!